On the second anniversary of the Fukushima disaster, an international panel of leading medical and biological scientists, nuclear engineers, and policy experts assembled at the prestigious New York Academy of Medicine. A project of the Helen Caldicott Foundation and co-sponsored by Physicians for Social Responsibility, this gathering was a response to widespread concerns that the media and policy makers had been far too eager to move past what are clearly deep and lasting impacts for the Japanese people and for the world. This was the first comprehensive attempt to address the health and environmental damage done by one of the worst nuclear accidents of our times. The only document of its kind, Crisis Without End represents an unprecedented look into the profound aftereffects of Fukushima. In accessible terms, leading experts from Japan, the United States, Russia, and other nations weigh in on the current state of knowledge of radiation-related health risks in Japan, impacts on the world’s oceans, the question of low-dosage radiation risks, crucial comparisons with Chernobyl, health and environmental impacts on the United States (including on food and newborns), and the unavoidable implications for the U.S. nuclear energy industry. 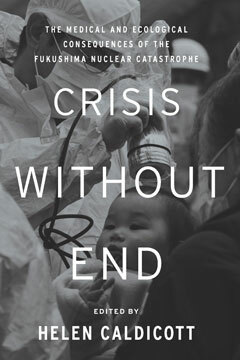 Crisis Without End is both essential reading and a major corrective to the public record on Fukushima.